When I read the comments on my "More Thoughts On Growing Animal Feeds" post, I realized that there are quite a few of you researching and pondering the same thing, and coming up with a similar conclusion, that it's a complicated and often discouraging topic. Methods and opinions often contradict one another, as does the research. For goats though, most agree that forage (grass, browse, hay) should be the mainstay of their diet, supplemented with grain as needed, free choice minerals tailored for one's particular location, and plenty of fresh water. Here is something though, that is useful for those of us wanting to make our own grain mixes, whether homegrown or purchased. It's the Pearson Square, a tool that can be used to calculate the amounts of two components needed in a particular mix. It was originally developed to standardize the fat and protein contents in commercially produced milk. Since then, it has been used for wine making, juice mixing, cheese making, baking, and of course, feed formulation. I read about it awhile back but didn't undertand it until Karen sent me a couple of links, this one at Colorado State, and this one from the Virginia Cooperative Extension. The first article helped especially, and in an attempt to master it myself, I'm going to try to explain it to you! It can be used for any animal and any nutrient, but since I've been pondering protein, that's what I'll use in my examples. I'll start with whole wheat and cowpeas, things I've grown successfully here. 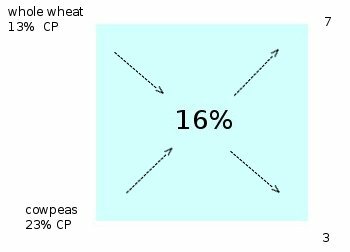 Problem: Determine the amounts of whole wheat and cowpeas needed to mix a goat feed of 16% crude protein (CP). 1. Target amount goes in the middle of the square. Rule: subtract the lower number from the higher. Number order doesn't matter, just the difference. The parts are translated as weights, so for example, I could mix 70 pounds of whole wheat and 30 pounds of cowpeas to achieve a 100 pound dairy goat ration of 16%. Obviously the Pearson Square is very useful if only two things are involved. But what if I have more? What if one year I harvested 100 pounds of wheat (13% CP), 50 pounds of grain sorghum (10% CP), 90 pounds of cowpeas (23% CP), and 45 pounds of black oil sunflower seeds (16% CP). 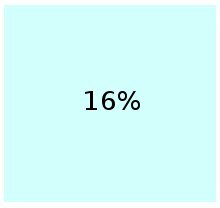 How would I know what amounts to mix to get my 16%? This gets trickier. I would have to make two mixes first, figure out the crude protein in each mix, and then use the Pearson Square to calculate how much I'd need of each. 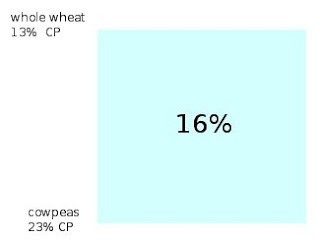 Wheat and grain sorghum could be combined as my grain mix, while the cowpeas and BOSS would be my protein supplement. This means math! Problem: Determine the amounts needed to make a 16% crude protein feed mix with more than two ingredients. Step 1: Find the percentage of each component in the mix. Example: to find the percentage of each ingredient in my grain mix, I first need to know the total (whole) weight. 100 lb of wheat is what % of 150 lb? 100 divided by 150 is .6666666 parts of 100. Rounded up, it equals 67%. 100 lb of wheat would be 67% of my 150 pound grain mix. For the grain sorghum, 50 lb of sorghum is what % of 150 lb? 50 lb of grain sorghum would be 33% of my mix. I would follow the same steps for my supplement of cow peas and BOSS. I'll spare you the calculations, but the answer would be a mix of 20% crude protein. The equal number of parts in my final mix means I have a 50/50 blend of the two mixtures. There is website to help you figure this out too, the online Pearson Square calculator at prechel.net. 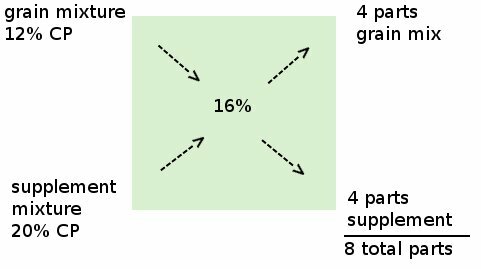 You need to know the percent of each mixture plus a target percentage, also the weights. The calculator will give you the weights of each component needed to achieve the goal. That goal could be any nutrient: protein, fat, calcium, etc. When I researched crude protein in various grains and seeds, I discovered quite a variation in estimates. Soil condition plays a huge factor in this, the more deficient the soil, the lower the protein and other nutrients will be. For now, I thought it best to stick the lower percentages. As we improve soil fertility, I know the nutritive value of our grains, hay, vegetables, and forage will improve as well. I don't know if that makes any sense to you dear readers, but writing it out like this has helped me tremendously. If it's still confusing please let me know. I had to work through my own examples to get a grasp on it and will have to refer back to this post when I actually start doing it. I'm just thankful to have another tool tucked under my homesteading belt. 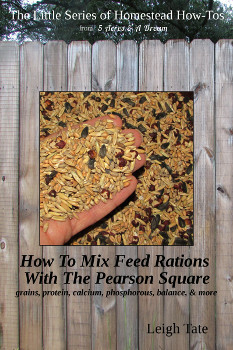 For those of you interested in keeping a copy of this information handy, I've put it and more together in a little eBook entitled How To Mix Feed Rations With The Pearson Square: grains, protein, calcium, phosphorous, balance, & more. 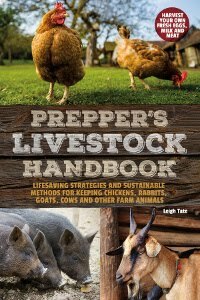 It includes the steps covered here plus information on commercial feed ingredients, choosing the right feeds for various farm animals, crude protein, nitrogen, phosphorous, feeding to prevent hypocalcemia, ketosis, and urinary calculi. Also contains charts of nitrogen, calcium, and phosphorous content of common feedstuffs. Click here for chapter listings and where to buy. You lost me at calculate! LOL! Just kiddin, good stuff! This is a very helpful posting! The formula seems really complicated at first glance but it makes sense. I'll have to hold onto it for that beautiful day when I can raise chickens and goats etc.! Thanks so much for taking the time to explain this to us! This is a FABULOUS post. I never knew this existed. I have been considering trying to mix my own feed for some time but was waylayed by what grains to mix together and the percentages. I would find combinations online, but I either couldn't get all the ingredients or I didn't know how to substitute something for another. What a great post! (Have I ever mentioned I have a real hang-up with story problems?) I was unaware of The Pearson Square and you did a great job of explaining it and educating us. P.S. Do you ever stop thinking, researching and learning?? Poppy, I think the initial figuring out seems complicated, but it just a matter of plugging in numbers really. A very useful tool! Jaime, that was my problem. Compared to the way I was trying to figure it out, this is actually quite simple! Candace, thank you! I ran into the same problems you describe. I'm so thankful for Karen, who sent me the links for this. Donna, thanks! That sounds like almost every discipline in real life and I'm guilty of the "on hand" thing too. I figure this will give me some targets to aim for this summer, in regards to what to plant. I really do want the healthiest animals we can manage. What a wonderful post! I admit, the first time I read about the Pearson Square it scared the begebees out of me. It was WAY over my head and I decided that as a newbie, I'd better stick to commercial feed. Now you have me thinking again. Strawberrymom, I think we're all probably safest to stick with a commercially formulated feed at first. It takes time and research to understand a particular species nutritional needs. OTOH, it's not impossible to do it oneself! I'm starting out small, and will supplement with commercial feed as needed. Still, it's a goal to be self-sufficient in this area. It's a good thing I love math. Actually, these type of formulas are fun to me and I love seeing how all the calculations work out. Very neat! And also too much for my brain to handle :P !!!! I lovelovelovelovelove your blog by the way, I'm here all the time trying to gain knowledge of the farming biz.... I'm what they call... what? hmmm... a wananabe farmer? Sure that works! Mostly I'm a Waldorf Doll making knitting little dollies for kiddies whilist trying to raise my own flock of children under 5 with another one on the way, and in my spare time I'm learning all I can about farming through books (I know funny right? books?!) we are buying our first peice of land next month and I am trying to see what I can grow at 10,000 ft elevation and a zone 4!! Laughbale right? It's in CO in case your curious. Enough about me... I love your blog! Benita, I love it that you love it, LOL. I think creative weavers tend to lean toward numbers anyway. Samantha, actually, I think you're going about it in a very good way. Many of us learned everything we know from books! 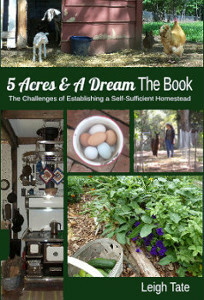 Have you read Sepp Holzer's Permaculture? He farms at over 5000 feet in Austria and is so encouraging to read. That's not as high as you, but I think if your family is willing to adapt to what you can grow, you can be quite successful. There are quite a few homesteaders in Alaska! So I think with experimentation, you can make a go of your Colorado property. you showed all the info needed with calculating except for when someone doesn't know the percentage of protein in the said item. for me i see the grams of protein in so much of that item but don't know how to get the percentage of it. how do we get the percentage of protein when we are only told on the said item so many grams of protein in so much weight of that item? just example lets say rolled oats is 50gram serving size and has 10grams of protein in that. how do we get the percentage of protein that would be? April, those are very good questions. You do need a chart or other resource for those protein percentages. I use the chart in Raising Milk Goats The Modern Way, which gives the percent protein. Also feed bags (for animal feed) will give the protein as a percent. 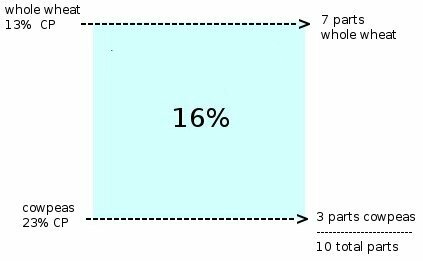 One of my favorite online tools for calculating percentages is at OnlineConversion.com. It's perfect for a question like your example - "10 grams is what percent of 50 grams". By plugging in those numbers, it tells me those rolled oats would be 20% protein. If there's something I can't find the protein for, I just google it. Different sources can give slightly different answers, so I take the middle one for my calculations. If I need to be specifically technical, I have it analyzed for percent protein by my local state cooperative extension office.